Over 40% of companies worldwide analyze big data and many are now enjoying a variety of benefits, according to “Big Data Use Cases 2015 – Getting Real On Data Monetization“, published this week by BARC. Topping the list of benefits realized from big data analysis are better strategic decisions (69%), improved control of operational processes (54%), better understanding of customers (52%) and cost reductions (47%). Furthermore, those organizations able to quantify their gains from analyzing big data reported an average 8% increase in revenues and a 10% reduction in costs. Whether or not big data initiatives thrive in companies depends to a large degree on their management. In companies where big data initiatives are an integrated part of business processes, senior management is the main driver or thought leader (61%). However, in organizations still considering using big data analysis, the corresponding figure is much lower at 34%. On the whole, business departments are still very passive and much less likely to be the drivers behind this topic. Previous BARC surveys have shown that organizations broaden their range of big data application scenarios as they gain more experience in analyzing big data. Currently, marketing and sales departments lead the way in big data analysis. Of the survey respondents who are using – or planning to use – big data, 25% said they have already integrated big data analyses in their marketing and 23% in sales. 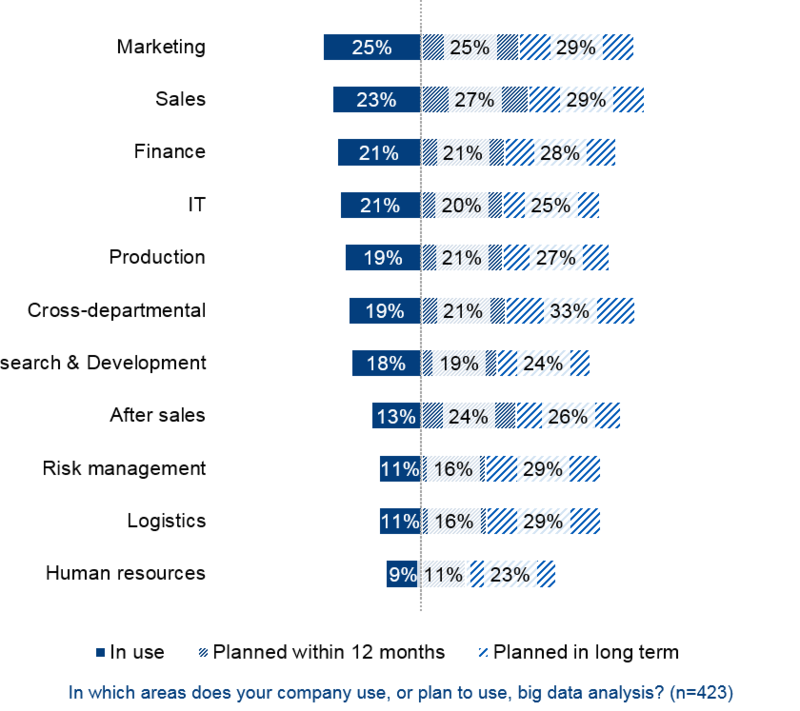 But big data is by no means confined to these areas: respondents reported plenty of big data use cases in all other departments including production, finance, controlling and human resources. The unusually high numbers for planned deployments by department (between 34% and 56% overall) suggest that, sooner or later, big data will reach every corner of the business. A total of 559 people participated in this survey. 37% came from Germany, Austria and Switzerland with another 22% coming from North America. Respondents represented a wide range of industries, most notably IT (16%), manufacturing (14%), consulting (13%) and retail (8%). This independent study is available free of charge thanks to sponsorship from Blue Yonder, Cloudera, Hewlett-Packard, Information Builders, pmOne, SAS, Tableau and Teradata.